Hello everyone, I wrote this guide to help anyone that’s looking to outsource to the Philippines. I hope you enjoy the content. Outsourcing tedious tasks to a virtual assistant in the Philippines is the latest trend these days for Amazon, eBay and eCommerce sellers. Why outsource and why the Philippines? Description: The web merchandiser is an important position in our eBay business. They are the backbone of the company and will produce most of the company’s revenue. The web merchandiser is responsible for creating quality listings that exceed eBay’s standards to insure maximum exposure. Description: The customer service rep is responsible for answering any questions that our customers may have. They are the first point of contact to our business and are our brand ambassadors. Description: The order processor is responsible for processing all of our orders, managing inventory on a daily basis, making sure the orders go out in a timely manner and marking orders as shipped within our eBay store. If you don’t think you have enough work for your VA on a daily basis, I would recommend that you keep the listing position as a separate job role, and you can combine any other job role to insure they have enough work for the day. You can also have a customer service rep be trained to do listings or order processing. However, I strongly recommend that you have one full time VA creating listings, because the more listings you have the more money you’ll make. One question I often get asked is, “how fast can my VA make listings”? My answer is always, “they can be just as fast as you or faster”. With the right training, your VA will be able to create listings just as good as your or better. The number #1 reason the Philippines is the best place to hire your VA is “communication”. The Philippines is the 3rd largest English speaking country in the world next to the USA and the UK. It is also known as the “world’s English budget teacher”. People from all over the world go to the Philippines to learn English. Filipinos have a high literacy rate and have an “American westernized culture”. The Philippines beat India a few years back as the #1 outsourcing destination for call centers in the world. The Filipino culture is also another reason most people go to the Philippines for outsourcing work. They are generally very polite, well mannered, very hardworking and honest people. They are very easy to please and will do whatever they can to make their boss happy. As long as you treat them well, they will treat you even better! Economics of scale, you can buy a Big Mac meal for around $2 in the Philippines, but the quality of work is just as good as America’s workforce. You can get a highly skilled professional that’s college educated for a little under what you would pay a minimum wage worker in America. How is this possible? The cost of living in the Philippines is much lower compared to America, Australia and the UK. NOTE: The skills of your VA will largely depend on their work experience and training, the more experienced your VA the higher their salaries will be. Just like with most people, you get what you pay for. Payments to your VA are all tax deductible as a business expense! The time zone difference could be an advantage for most businesses. Why? Because by the time you wake up, everything has already been done for you! A typical office hours shift for a Filipino is from 7am-4pm PHT, which is 3pm to 12am PST. If you’re in California, and your VA starts at 7am it will be 3pm the previous day. By the time they end their shift, they would have already processed any additional orders and messages that you’ve gotten that day. By the time you wake up, they would of already done a full days of work! It’s like having your business operate almost 24/7. Imagine if your customer were to get a response at 11pm at night? They would be thrilled! The biggest mistake most people make when outsourcing something to another country is that they don’t spend enough time making detailed instructions. You have to realize that the VA doesn’t know your business like you do; if you give them “crap” instructions they will deliver “crap” work. Same goes with the data you provide, if you give them “crap data” you’ll get “crap listings” The old saying goes, “you’ll only get back what you put in”. Before we go into creating a sample project, you’ll need to know the tools you’ll need to manage this project effectively and efficiently. Time Doctor (www.timedoctor.com) – Time Doctor is software that makes remote management a breeze! It is similar to the same software oDesk uses. This software will take random screenshots of your VA’s computer and will even record the number of keystrokes and time they’ve spent on each task. Snagit (www.snagit.com) – Snagit is a video capturing software from the same makers of Jing. I highly recommend you create training videos for your VA on certain aspects of the business that you need them to know. For example, you may have a certain process you like to do with listings or market research. By creating video’s, you can train them when it’s most convenient for you. Teamviewer (www.teamviewer.com) – Teamviewer is an all-in-one software for remote support and online meetings. You’ll be able to train your VA live and have online meetings with them. The software is free to use and works best with Skype when you need to speak with your VA. I don’t recommend using their built in voice app, it doesn’t work very well. Microsoft Excel (office.microsoft.com/en-us/excel/) – Spreadsheet program that will enable you to pass your data to your VA for easy manipulation. Will save you hours of work when dealing with large amounts of data. Make sure your VA knows how to use EXCEL. Adobe Photshop (www.photoshop.com) – the world’s best photo editing program. Magento m2ePro (www.m2epro.com) – One of the best listing tools for eBay/Amazon, it can be compared to enterprise listing software without the high monthly fee’s (thousands of dollars to be exact). This will enable your VA to list onto eBay efficiently and effectively, you can have a web site at the same time too! 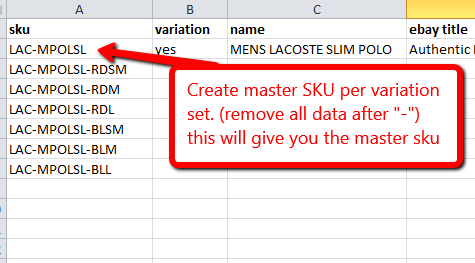 With this software, you’re able to import/export data using CSV files at will. Mangento and M2ePro are completely open source, so it’s free! The only investment you will have to make is setup of the software and pay monthly for a dedicated server which is around $50 a month. SixBit Software (www.sixbitsoftware.com)- Another great software for listing since you’re able to import/export data out using excel/csv files. The only downside to this software is that its desktop based. It’s a little harder to manage since your VA is in another country, so if that’s the case I recommend that you only use SixBit for listings and not inventory management/order processing. Another alternative is to have your VA remote into your computer and they can work directly off your computer using teamviewer. Now that you’re equipped with the tools of trade for eBay/Amazon outsourcing, let’s go onto how to properly create a project for your VA! For this sample project, I’m going to give you all the details you’ll need to successfully have your VA make eBay listings efficiently. Let’s pretend you’re selling in the fashion category on eBay, particularly clothing. For this project to be successful you’ll need to give detailed instructions on how you want your products listed, every business is different and has their own way of gathering data, so I’m going to make this as general as possible. When creating instructions, it’s good to use the tools mentioned above like Jing for screen capturing and Snag it for videos. Please note: this is assuming your VA is already trained in eBay listing. If they are not, you will have to do some extra leg work and train them with either videos or give step by step process on how to do things. It is always good to have training documents for your VA, in the event you need more staff or you fire your VA, you’ll have training documents already for your new employee. Project scope: In this project, we will be creating eBay listings using the data I provide you with. Below are the links to the supplier file and the template file for eBay. 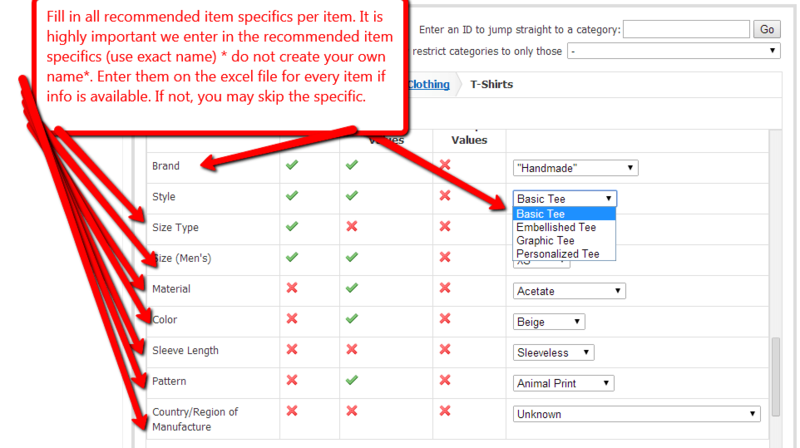 I need you to fill in the following missing fields from the template file, using information from the supplier file and the manufacturer’s web site. Note: It is always good to let the VA know what the purpose of the project is for, this will let them know why they’re doing the project is and what’s their purpose. Without purpose, there’s no passion. I’ve already completed the first SKU as a sample you can follow. You will need to fill in the rest of the fields. Some of the images are missing, so you will have to find any data that’s not provided from the Manufacture site. If they are not available, let me know and I’ll let you know where else to look. Below I am using Jing to communicate my instructions and thoughts visually. I let the VA know that it’s okay to ask questions. One thing about Filipino people, they are shy so its good to be direct with them. But not too direct, as Filipino’s are also very sensitive to confrontation. What to do after you receive the file? You will want to QA (Quality Assurance) the file for any errors. This is your chance to correct anything that they didn’t do right. You will want to show them what they did wrong and show them the proper way it should be done using Jing or Snagit. Once they learn the correct process, they will most likely never make the same mistake again. A big mistake most people make is that they don’t take the time to show their VA the correct way of doing things, if you spend time with your VA they will eventually become a replacement of you. As you learn to work with your VA, they will eventually become more efficient as they learn your business. The first week is usually the hardest as you are both getting to learn one another, but after the first month it gets a lot better! I would say it takes a good month or two before you both come up with a process that works well. I can assure you one thing, the investment of time and the money is worth it once your VA is trained for your business. Once trained, you’ll have time to focus on growing your business as opposed to working in the business. I’m going to go into the different types of VA’s available today and what the differences are. There’s the freelancer and the Agency VA. The Freelancer VA - The freelancer VA is the one that usually works remotely from home. They are usually stay home parents or people who don’t want to travel into the city for work. The Philippines is a heavily populated country with a population of 105,000,000 people. Most Filipino workers will spend on average 2-6 hours minimum on the commute to work per day. A good comparison would be rush hour in the cities of New York and Los Angeles. Freelancer VA’s are good for short term projects or if you’re on a low budget. On your terms – The working terms are between you and your VA and not an Agency. Typically, you can let go of your freelancer whenever you like. Of course, it’s always good practice to give them a 2 week notice that you won’t need their service anymore, they should do the same for you if they want to stop working for you. Slow Internet – The internet connection is usually slow, on average most Filipinos can only afford 1-2MB internet speeds. The reality is, internet is still very expensive in the Philippines and still in its infancy. Be sure to ask your VA what there internet speed is and to have them do a screen shot. At times, I’ve seen internet speeds go as low as .06MB depending on the time of day. I know this, because my internet at home is 3MB in speed and I’m paying $25 per month. Internet stability – The internet connection is not reliable, don’t be surprised if your VA doesn’t show up for work one day, only to tell you their internet connection was down. Reliability - The VA could magically disappear on you.I’ve heard many people say that they hired a VA only to never hear from them again. Most freelancers take in multiple jobs, so they might either have a new client that’s paying them more or they just don’t want to deal with you. There’s plenty of reasons for this, they might think you’re business is too hard to deal with or they just have a better opportunity somewhere else. They could also be having problems at home and aren’t worried about losing their job. Lack of eBay/Amazon experience - eCommerce is not very popular in the Philippines. eCommerce in the Philippines is like how it was back in the 1990′s when it was just first starting and nobody knew about it. If you find a VA that has knowledge about eBay/Amazon, most likely they already had a client who’s trained them previously. Management – Since they are working from home, you will be the one to have to manage them directly and make sure they are happy. The tools I mentioned above like Time Doctor will help you in managing your VA remotely. If you’re not use to the Filipino culture, you might have a difficult time managing your Filipino VA. There is a cultural gap between Filipinos and other countries. Hard to find A Quality VA – If you’ve ever tried searching for a qualified applicant on oDesk, you’ve probably spent hours and hours looking through profiles, only to find that the applicant wasn’t fit for your business. This is the usual story for most businesses, the hardest part of outsourcing is finding a quality VA. The Agency VA - The agency VA is better skilled, trained and the quality of service is better. Don’t get me wrong, there are a lot of good freelancer VA’s out there, but they are hard to find or already taken. If you don’t want to waste time looking through hundreds of resumes on a freelancer web sites and job sites, I would hire a VA through an agency. Typically, an agency will find and recruit the best candidate for your business and then help you train and manage them from their office. Costs are higher than the freelancer VA, but still affordable. More reliable - VA’s who work for a company usually will always be at work. If ever your VA quits, the agency will provide you with a replacement right away and help train them again. Consulting – Typically, agencies have experts who can help you grow your business. They will provide you with advice on how to grow it and manage it better. Of course, this varies from agency to agency. You want to make sure you partner up with the right agency that fits your business model. Employees get Benefits – Agencies are required to pay their employees SSS, Phil Health, taxes and insurance benefits (optional) to their employees. This is equivalent to social security and Medicare in America. This is one of the main reasons an Agency VA costs more than a Freelancer VA. On top of that, Agencies also have office space, electricity, HR, accounting, high speed internet, employee retention programs, and the usual costs of running an office. Office environment -Your staff comes into a regular office to work without the distractions of being at home. They are surrounded with other professionals who can help them grow their career and influence them to do a job well done. Quality applicants – Agencies already have the resources to find quality applicants. A lot of quality workers won’t be looking around on freelancer web sites, freelancing is looked down upon by most Filipino people since freelancing is not known to be a well sought out profession to most Filipino parents. Most Filipinos want their kids to be doctors, lawyers or nurses and not entrepreneurs. Regardless if you go with the Freelancer VA or the Agency VA, be sure you interview the candidates and make sure they are the right fit for your business. If you’ve never tried outsourcing before, it’s a lot hard work finding the best person for the job, but once you find them, train them, there’s no going back! Now, you may think I get along with Filipinos really well, since I’m Filipino right? Truth be told I’m more American than Filipino. I like to consider myself a hybrid, I can see both sides of the coin. My family moved to California when I was 3 and I basically spent my whole life in California. I grew up in a traditional Filipino Family home, so the culture shock wasn’t too bad for me when I moved to the Philippines. However, I think I’m more than qualified to give you tips on how to deal with Filipinos. Read more about me here. Filipinos are Shy – When dealing with a Filipino, be sure to be on point and straight forward. You also have to constantly remind them to speak their mind. Unlike the American culture where we are taught to say anything and everything, it’s totally opposite in the Filipino culture. Most Filipinos are reserved or shy. For example, most Filipinos will most likely not ask for a raise, they will expect you to see their worth and hopefully you will give them a raise. In America, we are taught to be “go getters” If you want something, go get it! This is not the case in the Filipino culture. Filipinos are usually happy go lucky people – Filipinos are usually always happy and just want to live a simple life without any confrontations. If you feel that there are any issues, you should ask them right away. They might even deny there are any issues at all at first, but ask them again and you might get a different answer. Filipinos always say “Sir, Ma’am or Boss” – This is their sign of showing respect. Don’t get offended, it’s just part of their culture. Anybody of higher authority or older they will always get called “Sir, Ma’am or Boss”. If you don’t like it, just let them know to call you by their first name or they’ll keep saying it! Filipinos are Emotional – Filipinos are very sensitive and emotional people. Sometimes, you can’t be straight forward with them, because they might think they are in trouble or you’re mad at them. If you’re going to be straight forward, let them know that this is how you are and it’s normal in your culture. They might think you’re angry at them if you raise your tone of voice or type in all CAPS. As much as possible, you don’t want to affect the productivity of your VA.
Filipinos are family oriented – Family is everything in the Filipino culture. Many Filipinos live at home with their parents, siblings, and even aunts or uncles until they have enough money to move out. If they come from a poor family, everybody will just help each other with the bills. They call this “tulong”, which means to help. It’s very common for a son or daughter to work abroad and send money home to family members. If you’re hiring a Filipino VA that works from home, be sure they have a quiet room they can work in with little or no interruptions. Filipinos are motivated by money/bonuses – If you want to motivate your Filipino VA, do so with bonuses and pay raises for a job well done. If you find that they are a valuable asset to your company, pay them higher than the market rate. $7-10 an hour is like being paid $60,000 a year from an Americans point of view. Filipinos are very Appreciative – Letting your VA know they are doing a great job can go a long way. Give them constant feedback and they will be happy you are praising them for a job well done. If you treat them well, they will treat you even better! If you treat them the way you want to be treated, you will have a happy VA and they will produce great work for you. Filipinos are very caring and friendly – Filipinos are very nice, friendly, polite, and very caring in general. It’s part of their culture. There is a reason why a lot of nurses are Filipinos. Nursing is not an easy job, it takes a certain individual to nurse another person back to health. If you ever walk into a Filipino home, the first thing they will do is ask you to sit down and eat. They will then start bringing you all sorts of food and drinks. They are very polite and courteous people. Filipinos are very traditional and Romantic – Filipinos are very romantic people, they don’t believe in divorce and divorce doesn’t exist in the “Philippines”. Most Filipino women want to find the love of their life and if things don’t work out, they will try everything in their power to make it work. They are also very traditional and are big on holidays. I would suggest that you follow the Philippine Holiday Schedule so your Filipino VA can spend it with their friends and family. Filipinos don’t know much about eCommerce – eCommerce in the Philippines is still in its infancy, much like it was back in the 1990s in America. Only 5% of the population has credit cards, so you can imagine how hard it is to buy something online in the Philippines. Almost everything is done in cash. If you’re going to hire a Filipino for eCommerce, you will have to train and educate them about the industry and what eCommerce really is. 13th Month Pay – By Philippine law, all rank-and-file employees, regardless of their designation or employment status, and irrespective of the method by which their wages are paid, who have worked at least one month during the calendar year are entitled to 13th month pay. The 13th month pay shall be in the amount not less than 1/12 of the total basic salary earned by the employee within the Calendar day. This is basically a bonus required by the govt to help Filipino workers have a better Christmas for their families. If you’re dealing directly with your VA, you’re not required to give them a 13th month pay, but its only right that you do. If you’re dealing with an agency, it’s already included in your rate depending on your arrangement. I hope that you enjoyed the content and that you have a fresh outlook on how to deal with Filipino VA’s. Please keep in mind, not all Filipinos are like this, but from living and working with them you can find at least one of these traits with most of the Filipino people. By having a better grasp of the Filipino culture, you should be able to understand Filipinos better in general and hopefully you’re on your way to a great working relationship and friendship! Have you outsourced before or are you thinking about outsourcing to the Philippines? Please let me know your thoughts on outsourcing and if you have any questions please comment below. I’d be happy to answer any questions you may have. Great content Carlo – thanks! I have recently hired my first educated VA and during my first couple of weeks have purchased her a monitor, printer – have experienced electrical and Internet failures as well as advancing pay to help offset some expenses. Now, some would say that I am crazy. To that I would say that first as the article states, you have to know the culture. Second, if you expect your VA to be productive, give them either enough money to afford a high speed connection and additional equipment or provide it for them. Your VA is a partner in your success. They are not a quick fix out of a candy machine. If you are going to hire a team of VA’s, hire an execuive assistant to lead the team and to provide all the crucial support to you as the manager. Communucate, communicate, communicate. Verbally, by emai or Skype chat. Communucate regardless of time of say. With respect to screen grabs. I don’t believe in them for administrative VA’s. Don’t watch the clock. Hire for full time and let it be. You will know if the task has been completed. Your training time is valuable. Documents all training so you can use it time and time again. Most importantly in my local area and employee is given three months to price their worth. The same should be said for your VA.
Hi Rick, great insights. Thank you. I hope you and your VA is doing well. Your reply is timely as it required me to read my original post. I now have two people working for me, my executive VA and one for website work and marketing materials. I just spent the last few days searching to replace the two assistants as things were not going smoothly. My eVA has had financial issues, been sick and is now trying to do renovations to her family’s home to raise it so that water doesn’t flow into the home. My eVA is only 23 and is the breadwinner of the home. From Western standards I would have cut her loose, but there is something about this VA that keeps me supporting her. Moreover, all the materials I read about the Phillipino people suggest that they are trustworthy, loyal and dedicated. Therefore, I am going to stay the course and lower my expectations a little and let the time play out. My biggest cost is not the actual payment, but the time in building the relationship. Hi Rick, I would suggest looking for a VA through a managed service or looking for a VA that lives in a more reliable area of the Philippines in terms of infrastructure. I would also suggest creating some metrics and kpi’s that are maybe tied to incentives depending on the role. Traditionally, Filipino’s are use to being managed this way and need to be watched closely with performance reviews, unless they have worked for a Westerner before and are already use to Western Standards. Also, constantly remind them that it’s okay to make mistakes as long as they learn from it, and you value their honesty and in the Western Culture, we are more straight to the point and like it that way. I am glad you are willing to build the relationship with the Filipino Employee, juts make sure she knows this and that you’re willing to invest in her long term as long as she performs. Good luck. Feel free to email me anytime for advice.